As my design esthetic has developed over the years, I’m discovering a deep love for all things vintage and historical. I could wax poetic about my love of bringing something old or discarded back to life in my own unique way, but really it’s the thrill of the hunt, saving pieces from the landfill is just a beautiful bonus 😉 And truth be told, they just don’t make furniture the way they used to. Quality, reducing waste, and a one of kind piece – yes please! 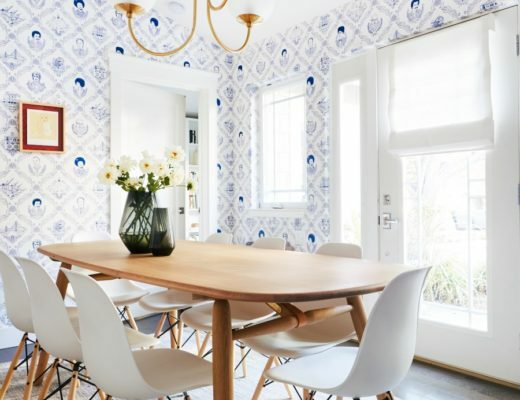 This weeks addition to the Inspired Interiors series is a gorgeous period home that’s given a contemporary update, while highlighting it’s traditional bones, giving new life to vintage pieces and remaining kid-friendly. 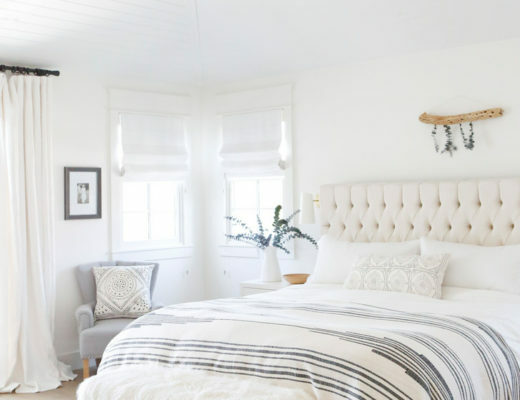 To highlight the traditional architecture of the home, designer Amie Corely, painted the walls and trim a warm white. She kept the furnishing neutral and then layered in a range of blues from navy to cornflower and grassy greens. Sticking to traditional colours played well with the age of the home, focusing the colour in daring fabrics, wallpapers and accents, kept the rooms feeling light and airy. Also allowing the palette to be easily switched up. 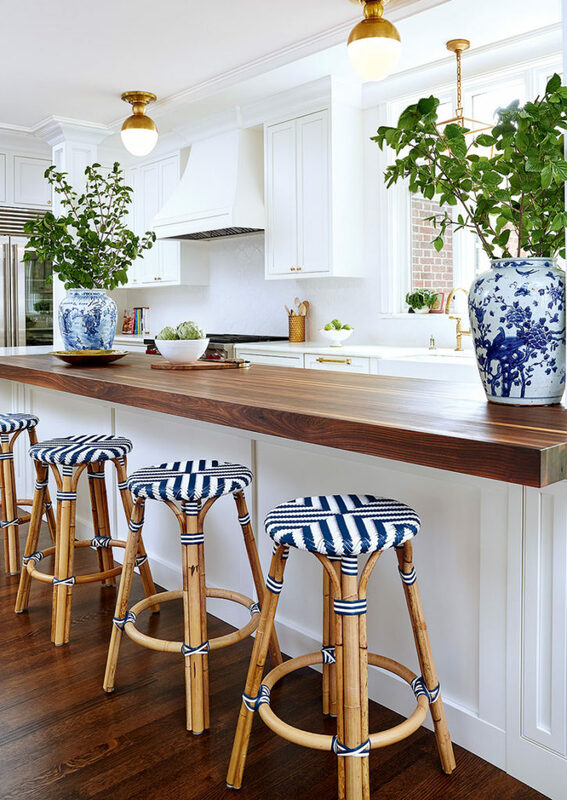 The beautiful eat in kitchen is home to nautical-chic white shaker-style cabinets with brass hardware, warm wood accents, spherical flush-mount light fixtures and subtle hits of blue, like the gorgeous chinoiserie vases and bistro stools – timeless and fresh. The blue is picked up in the navy-striped jute rug which adds texture and works really well with the apron sink. 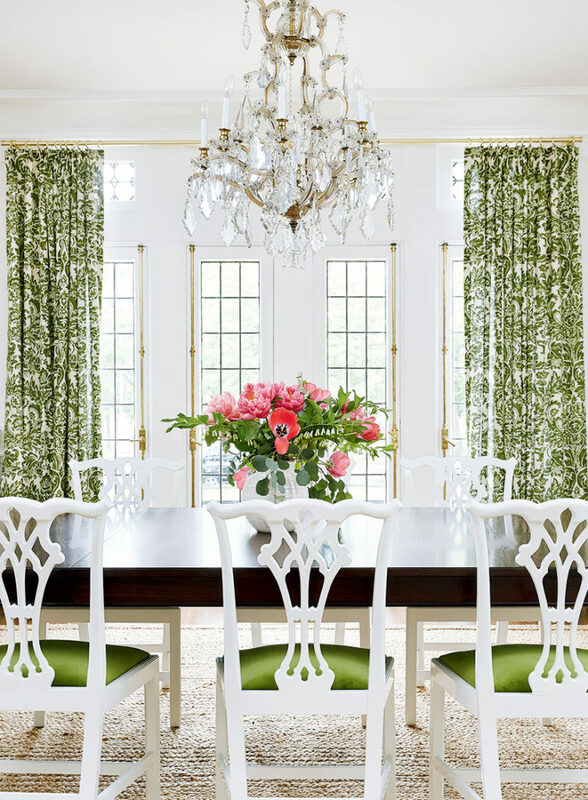 In the dining room vintage wooden chair frames were updated with white lacquer and upholstered in green velvet, which pops against the white. The dark dining table helps to ground the otherwise breezy space. The stunning green damask drapery ties the room together and brings in another traditional element with a modern twist. 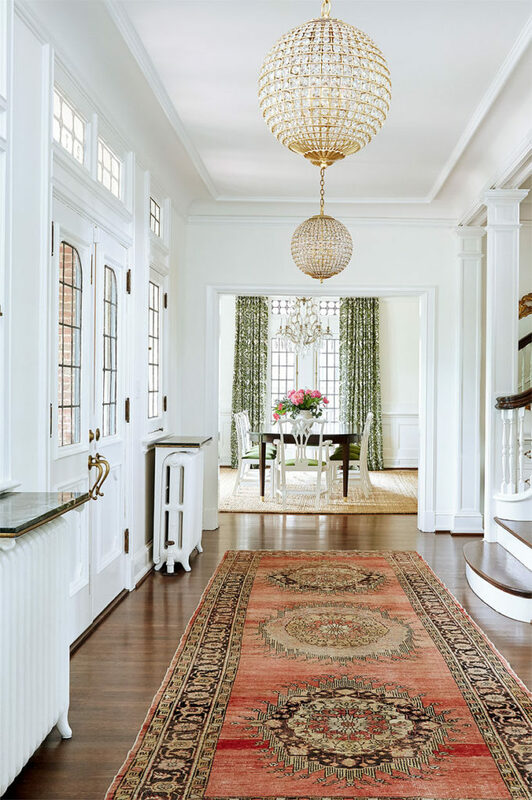 Glamour and old-world patina define the entry way where a blush toned vintage oushak runner is paired with spherical brass-and-crystal pendant lights. 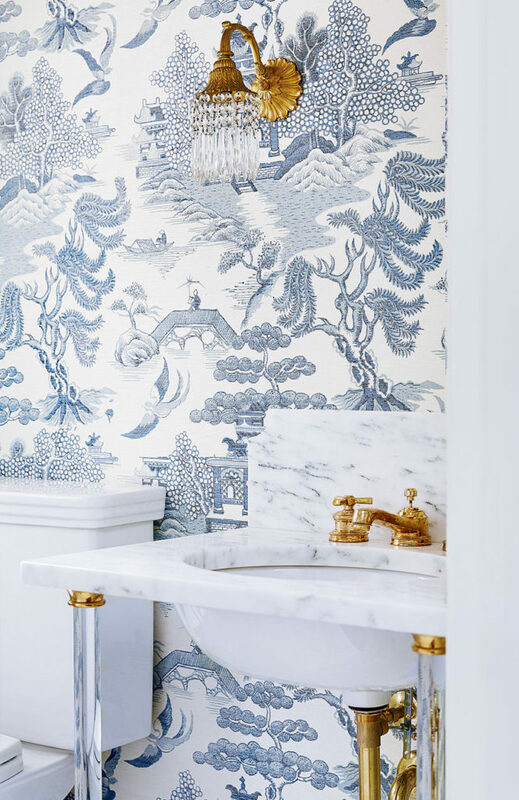 We see beautiful blue chinoiserie again in a grass cloth wallpaper in a show stopper of a powder room. 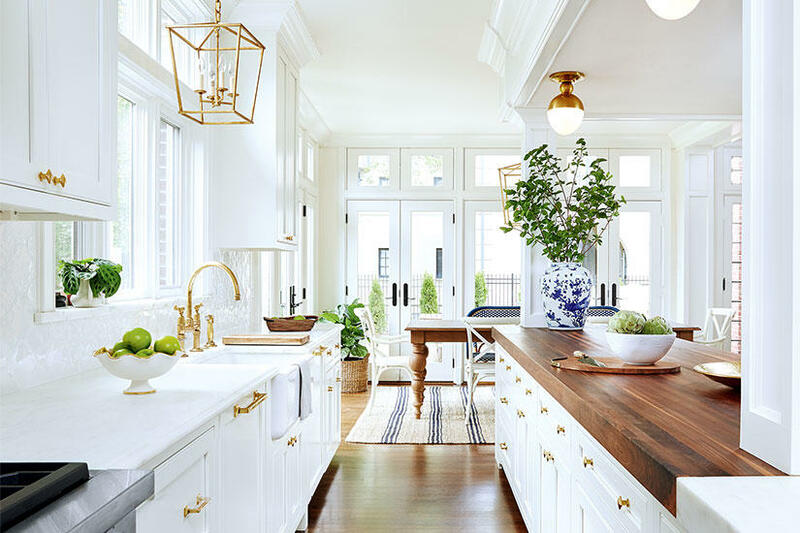 Paired with a Calacatta marble washstand sink with glass legs, exposed plumbing and vintage sconces (original to the home) creates my favorite room in the house. Aime embraces and highlights the beautiful historical elements of the living room perfectly. The Berber-style rug mimics the lead in the windows and the stunning fireplace is allowed to shine on it’s own, with only the addition of antique mirrors. My favorite addition to the room is the shagreen side table and leopard print pillows – completely unexpected, they give a modern and contemporary feel to the otherwise traditional room. 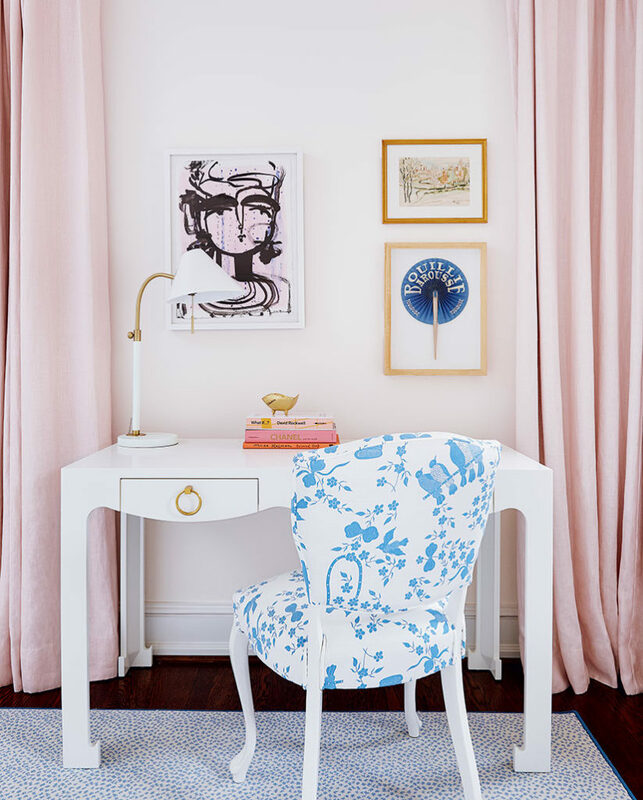 The perfect shade of pink is paired with cornflower blue to create a sophisticated, yet darling bedroom for one of the daughters. 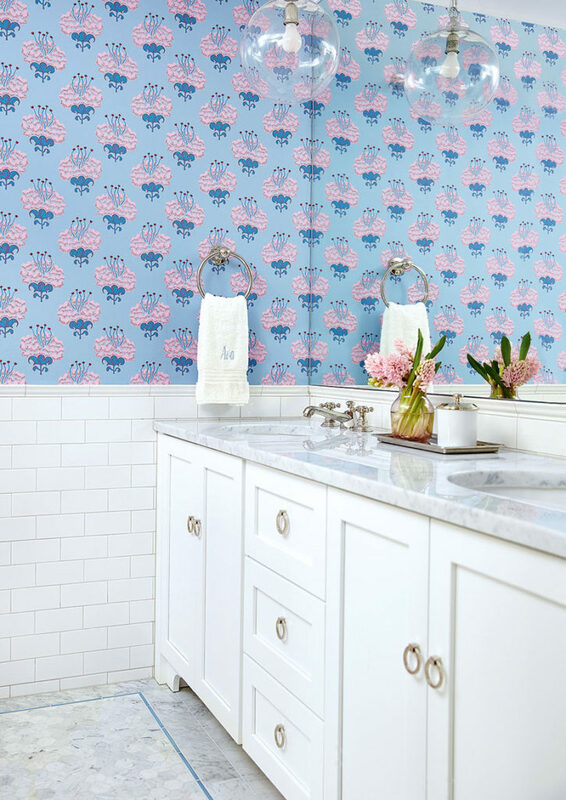 A palette that is mimicked beautifully in the bathroom she shares with her sister.